Several years ago my husband (then boyfriend) and I crossed the Italian-French border with my Piemontese relatives for lunch in the town of Menton. We each had an incredible salade composée, but what stood out in relief was the desserts. Each person ordered a dessert of crunchy-marshmallowy meringue bits, whipped cream, freshly churned ice cream and either fresh berries or chocolate and toasted hazelnuts. The combination of the whipped and frozen dairy mingling with the shattered pieces of meringue just killed me. 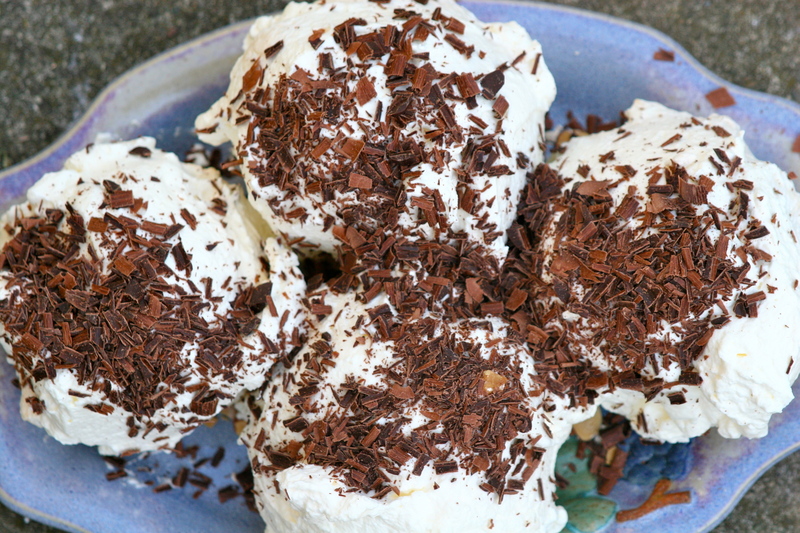 I adored the dessert with strawberries, but a photo of the meringues from Aux Merveilleux de Fred in Paris reminded me of this amazing dessert and inspired me to recreate a recipe for the chocolate-toasted nut version. I loved my rosewater-pistachio meringue so much that I elected to use the Ottolenghi hot sugar method instead of the Swiss or Italian meringue method. It also means less dishes since you can bake the sugar on the same parchment lined baking tray as you will eventually use for the meringues. Next, I choose almonds since they were already sliced and therefore would toast perfectly as the meringue cooked. One could omit the nuts completely or simply roll the meringue batter in half, or put the toasted almonds on at the very end with the chocolate shavings. I love the nuts embedded into the meringue like Rocher cookies. Once the meringues have cooled completely, you have many options for how to create your finished dessert. First, if you are going to fill your meringue, you can make a little hole underneath the meringue, or carefully cut it in half and fill the middle with either barely sweetened whipped cream, or ice cream. 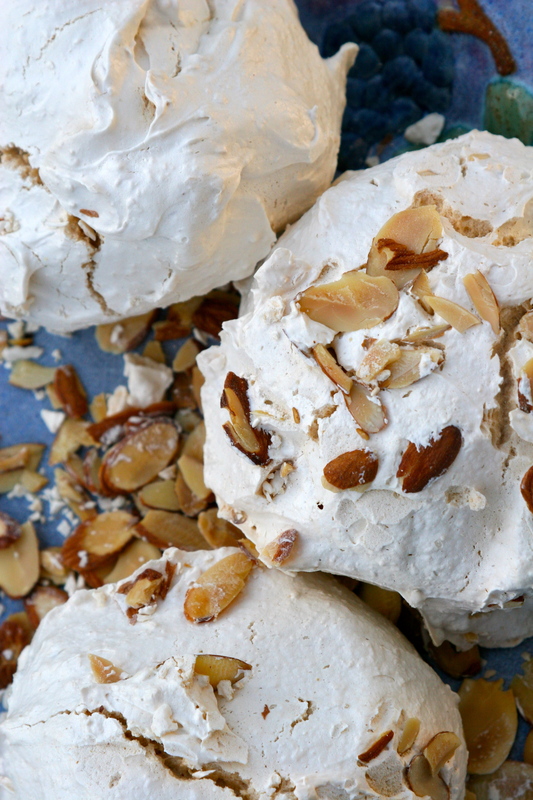 To do this, you will have to make very large (orange sized) meringues. After this, you take two large spoons or a curved rubber spatula and carefully cover the entire (reassembled) meringue with the whipped cream. Shave on copious amounts of very dark (70-85%) chocolate all around the outside or roll the ball into a plate of shavings and serve. 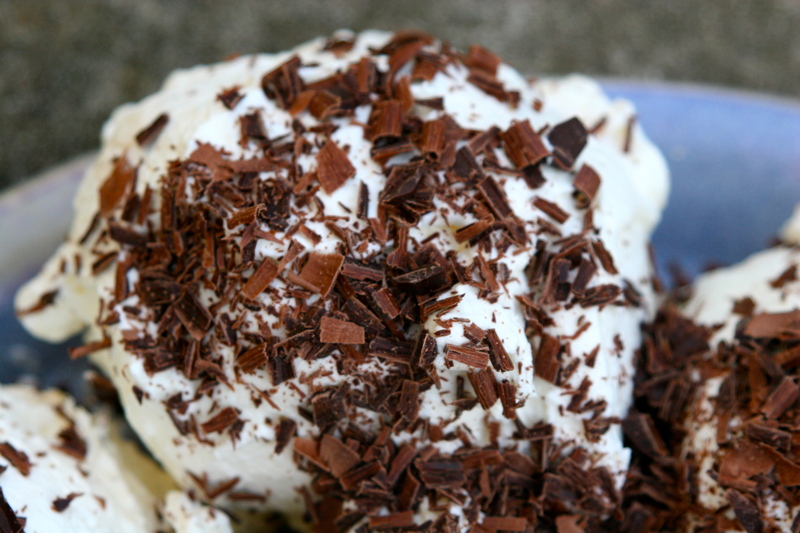 You can do this ahead of time too, if you are not using ice cream, and put the finished product into the refrigerator. These are so delicious that you may have to sneak a little bit before dinnertime. 1. Preheat oven to about 400F degrees. Evenly spread the sugar on a parchment-lined baking tray and put in the oven for about 8 minutes or until the edges just begin to dissolve at the edges. 2.While the sugar is in the oven, whisk the egg whites in a standing mixer on high-speed until they begin to froth up add the pinch of salt. 3. With the mixer on medium speed, add the hot sugar carefully and slowly, then the vanilla extract, if using. Turn to high-speed and mix for another 10 minutes or until cool. 4. Lower oven temperature to 225 F degrees and place sliced almonds (or whichever nuts you choose) on a plate. 5. Line a baking sheet (the one you just used for the sugar is fine) with parchment and dab just a tiny bit of the meringue batter under each of the four corners to secure it. With two gargantuan kitchen spoons mold a grapefruit-sized dollop of meringue, roll it onto your plate of almonds, and place on the parchment. Repeat, making room between meringues since they will expand and crack a bit as they cook. 6. Cook in preheated oven (225F) for about 2 hours, turning the front to back every half hour. The outside should be utterly dry, while the inside marshmallow soft. Cool before filling and covering. Cover leftovers in an airtight container or plastic bag. 7. To dress up your meringues, whip the cream in a standing mixer with a whisk attachment, past the point of soft whipped cream, but make sure it doesn’t begin curdling and turning into butter. It should just hold its shape. Whisk in the powdered sugar for 15 seconds. You want the whipped cream barely sweet on account of the sweet meringues. 8. Whilst the cream is whipping, shave your chocolate. I prefer 75-85% cacao solids because, again, the meringues are so sweet that the bitter dark chocolate is a perfect foil. 9. Either cut the meringue in half with a very sharp knife, or cut a hole underneath and fill with ice cream or whipped cream and extra nuts and chocolate. 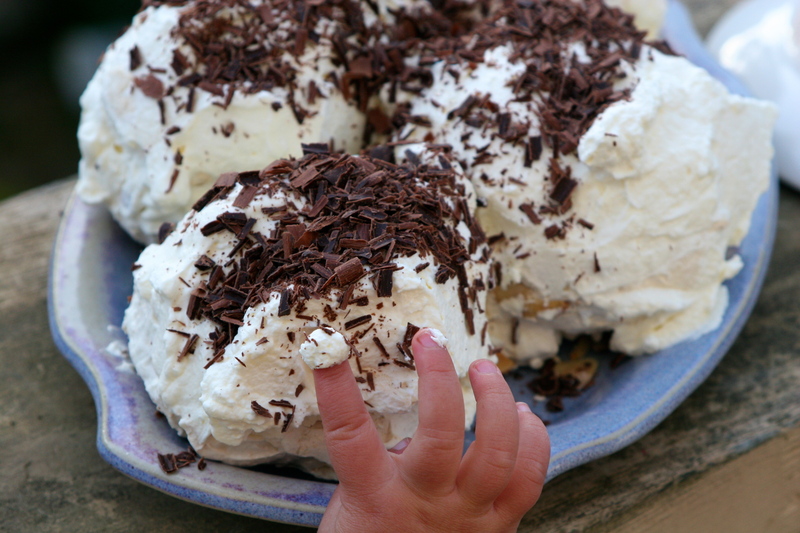 Close the meringue and then cover the entire thing with whipped cream and then sprinkle chocolate shavings (or just roll it onto a plate of chocolate). Voila! Eat immediately or refrigerate before serving. This entry was posted in Almonds, Chocolate, Cookies, Dessert, Nuts and tagged ice cream meringue nuts chocolate, meringue nut chocolate recipe, meringue with chantilly cream and chocolate, meringues with almonds whipped cream and chocolate, My Merveilleux de Fred recipe. Bookmark the permalink. I was fortunate enough to be around for dessert to try these. They taste even better than they look! The almonds are a must. I made these yesterday but sprinkled the tops with white chocolate flakes and served them in a pool of raspberry sauce. The technique for making the meringue produced a wonderful texture. It was one of the best things I have ever eaten! My mother loved meringue and I really wish she was still around to taste these. Heavenly! I am so happy to hear it! Your combination of flavors sounds delicious. I am a huge white chocolate fan and am going to post a white chocolate biscotti recipe very soon. What would happen if I substituted half the vanilla with pure almond extract. I think I’d die and go to heaven, that’s what. Can’t wait to try this!! Delicious. Let me know how it turns out.